Put 2 plates in the freezer for an hour. Use a melon-baller to scoop 15 balls from a tub of chocolate ice cream. Put on one cold plate. 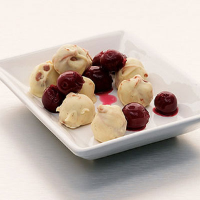 Melt 100g broken white chocolate in a bowl over a pan of just-boiled water. Put a sheet of baking parchment over the other cold plate. Use a toothpick to spear each ice cream ball and roll it in chocolate. Put on the parchment-lined plate and return to the freezer until solid. Serve with cherries in syrup.